There are several potential causes of dog limping. Here are some tips on what to do if your dog is limping. Dog owners know it can happen at any time. You let your dog out into the yard or take a walk through the woods, and suddenly, your best buddy comes back limping. If your dog is limping, even if they don’t seem to be in pain, you should investigate the cause. Dog limping can be because of a simple injury or a more serious problem. Here are a few tips you should remember when your dog experiences a sudden paw problem. Although seeing your dog limping may be upsetting to you, these injuries are generally minor. Your dog may have cut a paw on a sharp rock or piece of glass. He or she may have lost footing on unstable ground and twisted a tendon or ligament. Many dogs limp after picking up a burr or thorn in their paws. However, sometimes, limping can signal a more serious problem. Osteoarthritis may cause an older dog to limp after outdoor exercise. Some breeds may experience luxating patellas that cause their kneecaps to go out of alignment during exercise. Cruciate ligament disease, in which the ligament that connects the thighbones to the lower leg bones, can cause limping after activity. 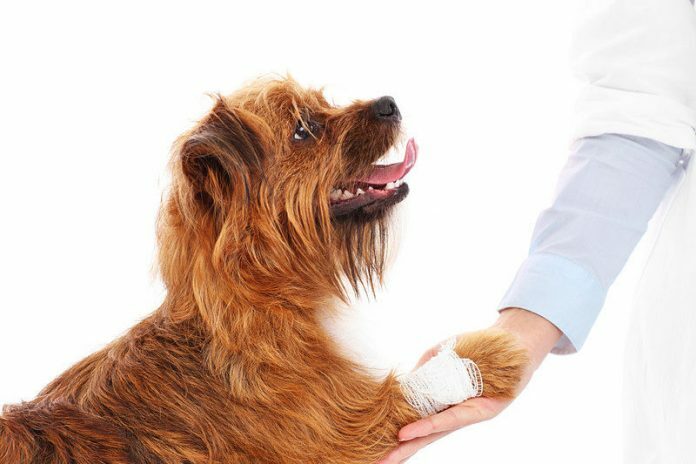 Of course, a serious injury such as a fracture or puncture wound can also occur, which requires immediate veterinary treatment. If your dog suddenly starts limping, do a thorough examination of their paws. Clean the bottom of the paws gently with soap and warm water. Check the pads for cuts or thorns. Make sure you check the skin between the toes, where burrs or splinters can hide. If bleeding is present, try to see where the injury is located. Small punctures may not require veterinary care. Simple cleaning and application of Neosporin will heal the wound. However, if bleeding is significant, your vet will provide proper treatment of the wound. Swelling on the paw itself can signal a sprain or injury that is not visibly apparent. An ice pack or bag of frozen vegetables placed on the area at intervals can help to reduce the swelling so you can better inspect the injury to determine its extent. Icing the area may be enough to repair a minor sprain. If your dog continuously licks at the area, seems depressed, yelps when the area is touched or seems unwilling to play normally, this could indicate that the wound is more serious than it appears and is causing pain. Make an appointment with the vet to determine the source of the problem. Do not give your dog over-the-counter pain relievers unless your vet recommends it. If your dog continues limping for more than an hour or two after initial signs or appears to be in any pain, make an appointment with the veterinarian to have the injury diagnosed. Your vet will provide an x-ray and other tests to determine the cause of the problem and will begin appropriate treatment. If the injury occurs after office hours, an emergency veterinary service in your area can provide treatment. Limping and paw injuries are a common problem in dogs that spend time exercising outdoors. You should always keep a close eye on your dog when he or she is enjoying a romp in the woods. If a splinter or other injury occurs and you see your dog limping, even if they show no sign of pain, these tips will help you determine whether the problem is serious enough to see a veterinarian.